Four molecular imprinted polymer (MIP) membranes for Mebeverine.HCl (MBV.HCl) were prepared based on PVC matrix. The imprinted polymers were prepared by polymerization of 2-acrylamido-2-methyl-1-propane sulphonic acid (AMPS) as monomer, pentaerythritoltriacrylate (PETRA) as a cross linker ,benzoyl peroxide (BPO) as an initiator and mebeverine as a template. Four different types of plasticizers of different viscosities were used and the electrodes were fully characterized in terms of plasticizer type, response time, lifetime, pH and detection limit. The MBV-MIP electrodes exhibited Nernstian response in concentration range from 1.0×10-6 to1.0×10-1 M with slopes of 13.98, 19.60, -20.43 and 19.01 mV/ decade. The detection limit and quantification are found to be 4×10-6, 3× 10-6, 2× 10-5and 1.2× 10-6 M ,respectively. Interference study for inorganic cations and amino acids was also studied. The best electrode based tris (2-ethyl hexyl) phosphate plasticizer was applied successfully for potentiometric determination of mebeverine in commercial tablets. Excellent average recovery obtained by potentiometric methods was about 102.26% which is in good agreements with British Pharmacopoeia. تم تحضير عدد من بوليمرات الطبعة الجزيئية لدواء. Mebeverine.HCl على اساس استخدام بولي فاينيل كلورايد PVC كساند من خلال عملية البلمرة باستعمال 2-اكريل اميدو-2-مثيل-1-بروبان حامض السلفونيك(AMPS)) كمونيمر وبنتا اريثريتول تراي اكريليت (PETRA) كمادة تشابك و بنزويل بيروكسايد(BPO) كبادئ، و دواء Mebeverine.HCl كمادة اساس . بعد الحصول على المادة على القالب للدواء تم تحضير اربعة اقطاب باستخدام ملدنات مختلفة اللزوجة وتم دراسة عدة خصائص منها الاستجابة عمر القطب،الدالة الحامضية وحد التحسس. أظهرت الاقطاب المحضرة استجابة نرنستية بتراكيز تتراوح بين (1.0×10-6 -1.0×10-1 ) مولاري وميل19.60,13.98 , 20.43- و19.01 ملي فو لت/ حقبة وحد التحسس (10-6 ×4،3×10-6 ، 2×10-6 ،10-6× (1.2 مولاري على التوالي. كما تمت دراسة الانتقائية للاقطاب المحضرة مع الكاتايونات اللاعضوية والاحماض الامينية وكانت افضل النتائج المستحصلة هي للقطب الحاوي على الملدن ثلاثي (2-اثيل هكسيل) فوسفيت والذي تم تطبيقه بصورة ناجحة في المستحضرات الصيدلانية وكانت نسبة الاستردادية مساوية الى 102.26% وهي نتيجة مقبولة بالمقارنة مع دستور الادوية البريطانية. molecularly imprinted electrodes --- Mebeverine hydrochloride --- potentiometric method --- 2-Acrylamido-2-methyl-1-propane sulphonic acid monomer. In this work the study mainly investigated the inhibition behavior, and the adsorption properties of different concentrations of an aqueous extraction of thyme plant range (5-20) ppm at the temperature range (288-318) K for corrosion of dental amalgam in artificial saliva, by applying electrochemical method. The result showed good inhibitive action for all thyme extract concentration with slight decreases by increasing temperature. The physisorption for thyme extract compound on the surface of dental amalgam obeys Langmuir isotherm. The kinetic parameter for corrosion process and thermodynamic data for adsorption process has been calculated. في هذا العمل :تحقق دراسة السلوك التثبيطي وصفات الامتزاز للمستخلص المائى لنبات الزعتر بمدى تراكيز (5-20) جزء بالمليون ومدى درجات حرارة (288-318) كلفن . بتطبيق الطريقة الكهروكيميائية . واظهرت النتائج فعل تثبيطي جيد لكل تراكيز مستخلص الزعتر مع انخفاض طفيف عند زيادة درجة الحرارة .الامتزاز فيزياوى لمركبات مستخلص الزعتر على سطح ملغم الاسنان مع اطاعة لمتساوى درجة الحرارة للنكماير .المعاملات الحركية لعملية التأكل والمعاملات الحرارية لعملية الامتزاز تم حسابها . Leishmaniasis is an endemic disease in Iraq, where both forms of the disease, cutaneous and visceral, are found. The effect of Zinc oxide nanoparticles (ZnO NPs) with mean particle size less than 100 nanometer (nm) on viability and growth rate of Leishmania donovani promastigotes was evaluated. The anti-leishmanial activity of different concentrations (0.1, 0.2, 0.4, 0.6, 0.8, and 1 µg/ml) of ZnO NPs was investigated on promastigotes growth rates and viability in comparison to promastigotes exposed to the same concentrations of sodium stibogluconate (Sb) (pentostam).The inhibitory concentrations (IC50s) of ZnO NPs were calculated after 24 , 48 and 72 hr which were (0.871, 0.156 and 0.120 µg/ml) respectively with significant (p< 0.05) differences between them ,while the IC50 of pentostam cannot calculated because more than 50% of parasites number remained viable after 24 ,48 and 72hr.The IC50s also calculated on the viability results to determine the most effective concentrations. They were 0.434, 0.361 and 0.182 µg/ml for promastigotes exposed to ZnO NPs after 24, 48 and 72hr respectively, while the same concentrations of Sb in the same periods didn't revealed the IC50s. The results concluded that ZnO NPs affect on the growth rate and viability of L. donovani promastigotes by dose and time-depended manner in vitro condition.داء اللشمانيات من الامراض المتوطنه في العراق بكلا شكليه الجلدي و الحشوي. في هذه الدراسة تم تقييم تأثير الجسيمات النانوية لأوكسيد الزنك مع متوسط حجم اقل من 100 نانومتر على نسبة النمو والحيوية للمسوط الامامي لطفيلي اللشمانيا الحشوية. تم التحري عن الفعالية المضادة للشمانيا للتراكيز المختلفة (0.1,0.2,0.4 ,0.6 , 0.8 و1مايكروغرام/مل) من جسيمات أوكسيد الزنك النانويه ZnO NPs على معدل النمو و الحيوية للطور امامي السوط بالمقارنة مع الطفيليات المعرضة الى نفس التراكيز من عقار البنتوستام . تم حساب التركيز المثبط لنصف عدد الطفيليات ( (IC50 لجسيمات أوكسيد الزنك النانويه بعد مرور 24 و48 و72 ساعة والتي كانت ( 0.871, 0.156 و 0.120)على التوالي ,بينما لم يتم حساب التركيز المثبط لنصف عدد الطفيليات ( (IC50 لعقار البنتوستام وذلك لأن عدد الطفيليات بقي اعلى من 50 % بعد 24 و48 و72 ساعة . وكذلك تم حساب ال IC50s من نتائج الحيويه لتحديد اكثر التراكيز الفعالة ضد حيوية الطور امامي السوط للطفيلي. وقد كانت قيمتها (0.434 , 0.36 و 0.182 مايكرو غرام/ مل) لل ZnO NPs بعد مرور 24, 48 و 72 ساعة على التوالي , بينما نفس التراكيز من عقار البنتوستام ولنفس الفترات الزمنيه من المعامله لم ثظهر قيمة ال IC50 .نستنتج من ذلك بأن جسيمات أكسيد الزنك النانويه لها القدرة على التأثير على معدل النمو و الحيوية للطورامامي السوط لطفيلي اللشمانيا الأحشائية اعتمادا على الجرعة والزمن في الظروف المختبرية . Nanoparticles --- Visceral leishmaniasis --- Pentostam. The recent study was conducted to measure some heavy metal content in potato and corn chips in Baghdad markets. Samples were analyzed by Atomic Absorption Spectrophotometer (AAS). Four metals, Cobalt (Co), Cadmium (Cd), Cupper (Cu) and Lead (Pb) were determined. Two types belonging to two manufacturer resources and two trademarks for each resource were tested in this work. Generally, the study recorded that the potato chips were containing metals less than the corn chips. According to Iraqi criteria, all tested types of potato chips were under the allowed levels. The mean of accumulation trend for both types was: Cu>Co>Pb>Cd. The mean of accumulation trend for the corn types of chips was: Baz>Pufack> Fantasia > Snack. The mean of accumulation trend for Potato chips was: Hlla>Mrsticks>Shepisco>Leez. Only Pufack (Jordan) Baz and Fantasia (Iraq) trademarks were containing levels of Cu exceeded of criteria. The aim of study is to monitor the levels of metals in chips food. أجريت الدراسة الحالية لقياس محتوى بعض المعادن الثقيلة في رقائق البطاطس والذرة في أسواق بغداد. وتم تحليل العينات بجهاز مطياف الامتصاص الذري (AAS). وقد حددت أربع معادن هي الكوبالت (Co)، الكادميوم (Cd) والنحاس (Cu) والرصاص (Pb) . تم اختبار نوعين ينتميان إلى مصدرين تصنيعيين وتم اختبار علامتان تجاريتان لكل مصدر في هذا العمل. سجلت الدراسة عموما أن رقائق البطاطس تحتوي على معادن أقل من رقائق الذرة. وفقا للمعايير العراقية، كانت جميع الأنواع المختبرة من رقائق البطاطس تحت المستويات المسموح بها. وكان متوسط الترتيب التراكمي لكلا النوعين كالتالي: Cu > Co > Pb >Cd. كان متوسط الترتيب التراكمي لأنواع رقائق الذرة: Baz > Pufack > Fantasia > Snack. وكان متوسط الترتيب التراكمي لرقائق البطاطس في كالتالي: Hlla > Mrsticks > Shepisco > Leez. كانت العلامات التجارية Pufack (الأردن) Baz وFantasia (العراق) فقط تحتوي على مستويات من Cu تجاوزت المعايير. الهدف من الدراسة هو رصد مستويات المعادن في رقائق الغذاء. Atomic Absorption Spectrometry --- Heavy metals --- chips. The study aimed to find an association between Type two diabetes mellitus (T2DM) patients, obesity and the rate of nasal carriage of Staphylococcus aureus (NCSA) producer of TSST-1 in patients with T2DM compared with non-diabetic control groups. T2DM patients and control subjects were selected from outpatient of "The Specialist Center for Diseases of Endocrine and Diabetes" in Baghdad. The subjects were divided into 4 groups: Group I included 21 obese T2DM patients; Group II included 20 lean T2DM patients; Group III included 20 obese as control group and Group IV included 21 lean as control group. The study included sample with size (n= 82), male and female, with the ages ranged from 35 to 75 years, and the patients were not on any kind of anti-diabetic treatment. A total number of the nasal carriage S. aureus isolates were 38, of them 23 S. aureus (56.1 %) were isolated from the groups of patients with T2DM and 15 S.aureus isolates (38.46 %) were isolated from the control groups. Molecular method was used to detect the presence of tstH gene in S. aureus isolates indicating that the presnce of toxic shock syndrome toxin-1. The results revealed the presence of this gene in 12 (63.16%) S. aureus isolates collected from T2DM patients and 7 (36.84 %) isolates collected from control groups. هدفت هذه الدراسة إلى إيجاد علاقة بين مرض السكري من النمط الثاني والسمنة ومعدل بكتيريا المكورات العنقودية الذهبية Staphylococcus aureus المعزولة من الانف و المنتجة لذيفان متلازمة الصدمة السمية-1 (TSST-1) لدى مرضى السكري من النمط الثاني مقارنةً مع الاشخاص الأصحاء غير المصابين بالسكري. تم اختيار كل من مرضى السكري من النمط الثاني و الاشخاص الأصحاء من "المركز التخصصي لأمراض الغدد الصم والسكري" في بغداد. وقد تم تقسيمهم إلى 4 مجاميع: المجموعة الأولى تتضمن 21 شخص سمين من مرضى السكري من النمط الثاني و المجموعة الثانية تتضمن 20 شخص من مرضى السكري من النمط الثاني بأوزان طبيعية و المجموعة الثالثة تتضمن 20 شخص سمين من الأفراد الأصحاء وشملت المجموعة الرابعة 21 شخصمن من الأفراد الأصحاء بأوزان طبيعية. شملت الدراسة على عينة بحجم (n= 82) من الذكور والاناث حيث تراوحت اعمارهم من 35 الى 75 سنة علماً ان مرضى السكري من النمط الثاني لم يتلقوا اي نوع من العلاج. كان العدد الكلي لبكتيريا المكورات العنقودية الذهبية S. aureus المعزولة من الانف 38 عزلة, منها 23 عزلة (56.1 %) معزولة من مرضى السكري من النمط الثاني و 15 عزلة S. aureus (%38.46) معزولة من الاشخاص الاصحاء. استعملت الطريقة الجزيئية للكشف عن وجود الجين tstH في بكتيريا العنقودية الذهبية S. aureus للإشارة الى وجود ذيفان متلازمة الصدمة السمية-1 (TSST-1). أظهرت النتائج وجود هذا الجين في 12 عزلة S. aureus (%63.16) التي تم جمعها من مرضى السكري من النمط الثاني و 7 عزلات S. aureus (%36.84) المجموعة من الاشخاص الأصحاء. Staphylococcus aureus Nasal Carriage --- Obesity --- Type Two Diabetes Mellitus --- Toxic Shock Syndrome Toxin-1. The modulation of chaotic behavior in semiconductor laser with A.C coupling optoelectronic feedback has been numerically and experimentally reported. The experimental and numerical studying for the evaluation of chaos modulation behavior are considered in two conditions, the first condition, when the frequency of the external perturbation is varied, secondly, when the amplitude of this perturbation is changed. This dynamics of the laser output are analyzed by time series, FFT and bifurcation diagram. سلوك تضمين الشواش في ليزر اشباه الموصلات ذو التغذية العكسية الكهروبصرية تم دراسته مختبريا وعدديا . الدراسات النظرية والمختبرية لتطور سلوك تضمين الشواش تحدد بشرطين , الشرط الاول عندما يكون تردد الاضطراب الخارجي متغير , اما الثاني عندما تكون سعة الاضطراب الخارجي متغيرة. دينامكية الخرج الليزري تفسر باستخدام تغير اشارة الشواش مع الزمن , تحويلات فورير والمخطط التشعب. We employ a simple effective nucleon-nucleon interaction for sd-shell model calculations derived from the Reid soft-core potential folded with two-body correlation functions which take account of the strong short-range repulsion and large tensor component in the Reid force. Shell model calculations for ground and low lying energy states of neutron rich oxygen isotopes 18-28O are performed using OXBASH code. Generally, this interaction predicts correct ordering of levels, yields reasonable energies for ground states of considered isotopes and predicts very well the newly observed excitation energy of in 26O. Besides, it produces reasonable energy spectra for 23-27O and compressed energy spectra for 18-22O isotopes. This is mainly due entirely to defects in the diagonal matrix elements of employed interaction. To improve the present calculations, we modify the interaction through replacing the 14 diagonal matrix elements of with those of the USD interaction. Mostly, our modified interaction predicts well the ordering of levels, the ground state energies and low lying energy spectra for all selected oxygen isotopes. The modified interaction confirms the location of the neutron drip line at and also identifies the presence of the shell gap at and which proves the doubly magic behavior of 22O and 24O. The spins in 24O of several excitation energies around 7.5 MeV are predicted by our interactions. The calculated results obtained with the modified interaction are very close to those obtained with the empirical interactions of USDB and WPN. تم استخدم تفاعل مؤثر بسيط للنيوكليون- نيوكليون في حسابات أنموذج القشرة sd المشتق من جهد Ried مع دالة الربط للجسيمتين التي تأخذ بنظر الاعتبار التنافر القوي عند المدى القصير ومركبة Tenser الطويلة في قوة Ried. حسابات أنموذج القشرة للحالات الارضية والمتهيجة الواطئة لنظائر الاوكسجين18-28O الغنية بالنيوترونات أجريت بأستخدام البرنامج OXBASH. عموما" هذا التفاعل يتوقع تسلسل صحيح للمستويات ويعطي تطابق مقبول لطاقات الحالات الارضية للنظائر قيد الدراسة. وكذلك يتوقع تطابق ممتاز لمستوى الطاقة المكتشف حديثا" في نواة 26O. الى جانب ذلك هذا التفاعل حقق تطابق مقبول لأطياف الطاقة بالنسبة للنظائر 23-27O ومظغوط نسبيا" للنظائر 18-22O. ان سبب ذلك يعود الى عيوب في العناصر القطرية التي لها T=1 لمصفوفة هذا التفاعل. ولتحسين الحسابات تم تعديل هذا التفاعل من خلال استبدال العناصر القطرية لمصفوفة التفاعل (لها (T=1 مع تلك الموجودة بتفاعل USD. غالبا التفاعل المعدل يتوقع تسلسلات جيدة للمستويات وكذاك يتوقع نتائج جيدة لطاقات الحالات الارضية والمتهيجة الواطئة لكل نظائر الاوكسجين قيد الدراسة. ان التفاعل المعدل يؤكد بأن خط تقطير النيوترونات عند N=16 وكذلك اثبت بأنه هنالك فجوة للقشرة النووية عند N=14 و N=16 والتي تؤيد بأن النوى 22O و24O هي نوى سحرية مضاعفة. الزخم الزواي للحالات المتهيجة القريبة من الطاقة 7.5 MeV تم حسابها بأستخدام التفاعلان المعدل والغير معدل. energy spectrum --- energy levels --- binding energy --- oxygen isotopes --- shell model. In this study, In2O3 was prepared by Solvothermal technique in autoclave device, which is a simple and inexpensive technique to indicate the best condition. The reaction took place between indium chloride and urea. In(OH)3 as-prepared annealing at 100°C and convert to In2O3 at annealing temperatures 300, 500, 700 °C for 90 min .The physical properties of nanoparticles were characterized by XRD, SEM, AFM, UV/Visible and FTIR spectroscopy measurements. The examination results of XRD for In2O3 powder annealed at different temperature showed the formation of a cubic phase of nanoparticles with high intensity of plane (222). The lattice constant decreases with the increase of annealing temperature (from 10.07 to 10.04 Ǻ). AFM indicated an increase in grain size of In2O3 with increasing of annealing temperatures (from 78.59 to 94.4 nm). The optical properties, transmittance of In2O3 nanoparticles at annealing temperatures 500°C have a high transparent reach to (89%) and Energy gap Increases with increasing annealing temperature in range (3.6 to 4.65 eV). في هذا البحث، تم تحضير اوكسيد الانديوم بتقنية الضغط الحراري باستخدام جهاز الأوتكليف ، وهي تقنية سهلة ورخيصة للحصول على افضل تفاعل بين كلوريد الانديوم و اليوريا. تم تحويل هايدروكسيد الانديوم الملدن بدرجة حراره 100م° الى اوكسيد الانديوم عند درجات الحراره 300, 500, 700م° لفتره 90 دقيقة. شخصت الخواص الفيزيائية للجسيمات النانوية بواسطة قياسات حيود الأشعة السينيه , المجهر الألكتروني الماسح مجهر القوة الذرية، الأشعة فوق البنفسجية/المرئية و مطيافية الأشعة تحت الحمراء. اظهرت نتائج فحص حيود الأشعة السينية للجسيمات الملدنة عند الدرجات الحرارية المختلفة الى تكون الطور المكعبي للتركيب البلوري لأوكسيد الأنديوم مع ظهور شدة عالية للقمة (222) وتبين ان ثابت الشبيكة يقل بزيادة درجة حرارة التلدين (من 10.07الى 10.04 انكستروم). بينت نتائج فحوصات مجهرالقوة الذرية هناك زيادة في الحجم الحبيبي لاوكسيد الانديوم (من78.59 الى 94.4 نانومتر) مع زيادة درجة حرارة التلدين.اضهرت الخصائص البصرية ان اوكسيد الانديوم النانوي انة يمتلك نفاذية عالية تصل الى (%89) عند درجة تلدين (500 م◦) و زيادة فجوات الطاقة مع زيادة درجات حرارة التلدين لتتراوح (3.6-4.65 الكترون فولت). Indium oxide (In2O3) --- Solvothermal --- cubic structure --- transmittance. Influence of Heat Treatment on Wear and Hardness Properties of MWCNTs Reinforced Epoxy nanocomposites. Nanocomposite of carbon nanotube add to epoxy resin material of weight fraction ( 0.25, 0.5, 0.75 1.0, 1.25, 1.5, 1.75 , 2 & 2.5 wt. % ) were fabricated by dispersing within an epoxy resin using a Ultrasound machine followed by mechanical stirring. The samples were heat treated at temperature ( 80 °C for 3 hrs) The mechanical properties of the composites were investigated. Wear and hardness properties measurements indicated higher wear rate and hardness with increasing concentration of MWCNTs . The MWCNTs significantly improved the wear resistance and hardness when compare than the pure epoxy. These note show too after heat treatment of composite with ( 80 oC for 3 hrs ). تم تحضير متراكب نانومتري من مادة الايبوكسي مضاف اليه انابيب الكاربون النانوية متعدد الجدران وبنسب وزنية (0.25 ,0.5 , 1.75 , 1 , 1.25 , 1.5 , 1.75 , 2 , 2.5 ) % بتفريق داخل راتنج الإيبوكسي باستخدام جهاز الموجات فوق الصوتية متبوعاً بالتحريك الميكانيكي . العينات تعرضت لمعاملة في درجة حرارة (80 درجة مئوية ولمدة 3 ساعات) وتم التحقيق في الخواص الميكانيكية للمركبات . قياسات خصائص البلى والصلادة لمتراكب النانومتري أشارت إلى معدل أعلى للبلى والصلادة مع زيادة تركيز انابيب الكاربون النانوية . اضافة الكاربون النانوي ادى الى تحسين كبير في مقاومة البلى)التأكل ) والصلادة مقارنة بعينات الايبوكسي النقي . وكذلك تظهر بعد المعالجة الحرارية للعينات عند (80 درجة مئوية ولمدة 3 ساعات) . Al-Salhubia, area is located within the arid region in southern Iraq. Although no surface water is available in this area, the groundwater is considered the basis in the area, it is available in both good quality and quantity. For that reason, it is of prime importance to examine water type in the unconfined aquifer to determine suitability of groundwater for irrigation purposes. The groundwater type in the studied area is Ca-Mg dominant SO4 facies according to Piper and Stiff diagrams. Based on SAR, Na%, RSC, EC, and PI, the groundwater quality in the study area is suitable for irrigation in general. تقع منطقة السلحوبية ضمن المنطقة القاحلة في جنوب العراق. ولعدم توفر المياه السطحية, تعتبرالمياه الجوفية الأساس في المنطقة وهي متوفرة بصورة جيدة نوعا وكما. لهذا السبب فان من المهم دراسة نوعية المياه في الخزان غير المحصور لتحديد ملائمة المياه الجوفية لأغراض الري. تتميز المياه الجوفية في منطقة الدراسة بسيادة سحنة كبريتات الكالسيوم والمغنيسيوم وفقا لمخططات Piper و Stiff. استنادا الى EC, RSC, Na%, SAR و PIتبين أن نوعية المياه الجوفية في منطقة الدراسة هي مناسبة للري بشكل عام. Analysis and determination of some of the elastic moduli and other geotechnical parameters in the campus of the University of Baghdad performed by using New Sonic Viewer in the field to measure (Vp) and (Vs) velocities as well as the density of the upper soil inside the campus. Seventeen profiles were selected each of (10) m. length distributed randomly inside the university campus to evaluate the top soil properties in addition to the soil profile. The ultrasonic waves showed two layers of the soil with different velocities of (Vp) and (Vs). The velocities of p-wave of the first layer ranged from (288-642) m/sec. On other hand the velocities of shear wave (Vs) in the same layer ranged from (88-193) m/sec. In the second layer the velocities of p-wave ranged from (681-972) m/sec., and the velocities of shear wave ranged from (327-463) m/sec.Depending upon the value of (Vs) and according to Caltrans soil types, these two layers were considered as soft and stiff soils of types ( E and D) respectively. The mean depth of the first layer in the area is (1.91) m. The densities of the first layer ranged from (1743-1999) Kg/m3. The values of Poisson's ratio, Young's modulus, Shear modulus, Lame's constant, Bulk modulus and Compressibility are also determined as well as some of geotechnical properties as earth lateral pressure at rest (KO), Concentration index, Ultimate bearing capacity, Material index, and the empirical relation was used to calculate (N) values of the standard penetration test (SPT) from shear wave velocities and its value ranged for the first layer from (2-35) b/30 cm. and for second layer the (N) values ranged from (25-45) b/cm., as well as the relationship between the most important geotechnical and elastic modulus with their equations on each graph. تم إيجاد بعض معاملات المرونة وقسم من المعاملات الجيوتكنيكية في ساحات الحرم الجامعي لجامعة بغداد باستخدام جهاز الموجات فوق الصوتية في الحقل لقياس سرع الموجات الطولية والمستعرضة للمسارات المختارة عشوائيا، فضلا عن أخذ نماذج للتربة وذلك لقياس الكثافة في كل موقع قياس والتي بلغ عددها (17) موقعا مختارا للقياس، واجري تحليل لهذه القياسات لتقييم خواص الآجزاء العليا للتربة بالاضافة الى الشكل الجانبي للتربة، علما بان طول كل مسار كان (10) أمتار وعدد القياسات في كل مسار كانت (10) قياسات. أظهرت سرع الموجات فوق الصوتية وجود طبقتين للتربة ذات سرع مختلفة للموجتين الطولية والمستعرضة، وكانت سرع الموجة الطولية للطبقة الاولى بين (288-642) م/ثا. وان سرع الموجة المستعرضة لنفس الطبقة كانت بين (88-193) م/ثا. أما السرع في الطبقة الثانية فكانت سرعة الموجة الطولية بين (681- 972) م/ثا. وسرعة الموجة المستعرضة بين (327-463) م/ثا. واعتمادًا على قيم السرعة المستعرضة واستنادا الى تقسيم (كالترانس) فان نوع التربة للطبقتين كان عبارة عن طبقات هشة ومتوترة للطبقة الاولى ومن نوع (E) و (D ) على التوالي. أما الطبقة الثانية فكان نوع التربة من نوع (D) فقط وعلى نفس التقسيم. وكان معدل عمق الطبقة الاولى في منطقة القياسات (1.91) م. أما الكثافات المحسوبة للتربة فكانت للطبقة الاولى فقط بين (1743-1999) كغم/م3 . ولقد تم ايضا إيجاد كلا من نسبة بوزان ومعامل يونك ومعامل القص ومعامل الصلابة ومعامل الانضغاطية ، فضلا عن بعض الخواص الجيوتكنيكية مثل ضغط الارض الجانبي في حالة السكون ومعامل التركيز وقابلية التحمل القصوى ومعامل المادة وقيم (عدد الدقات) من ( S.P.T) وذلك من سرع الموجات المستعرضة وكانت قيمها تتراوح بين (2-25) ضربة/30 سم. للطبقة الاولى وبين (25-45) ضربة/30سم. للطبقة الثانية. وكذلك تم رسم العلاقات بين معظم معاملات الجيوتكنيكية والمرونة المهمة مع معادلة كل شكل على المنحنيات. Epidemic model --- Stage Structures --- Vaccination --- Local and Global Sta+bility. B-spline --- blossoming --- parametric --- matrices --- two dimensional --- three dimensional surfaces. We extended the characterization of strict local minimizers of order two in ward,s theorem for nonlinear problem to a certain class of nonsmooth semi-infinite problems with inequality constraints in the nonparametric constraint case. تم توسيع نظرية وورد الخاصة بتمييز النقطة المحلية الصغرى الصارمة ذات الرتبة الثاني لمسائل البرمجة اللاخطية الى فئة معينة من مسائل شبه اللانهائية غير ملساء ذات قيود على شكل متراجحة في حالة قيد غير بارامتري . The security of multimedia data becoming important spatial data of monitoring systems that contain videos prone to attack or escape via the internet, so to protect these videos used proposed method combined between encryption algorithm and sign algorithm to get on authenticated video. The proposed encryption algorithm applied to secure the video transmission by encrypt it to become unclear. This done by extract video to frames and each frame separate to three frames are Red, Green, and Blue, this frames encrypt by using three different random keys that generated by a function for generating random numbers, as for sign algorithm applied for authentication purpose that enable the receiver from sure of the identity of the sender and provide secure communication between two communication parties.In the proposed method applied compression method before encryption algorithm on video by using discrete wavelet transform (DWT) to facilitation work of encryption algorithm because compression less size of video and this make execution time of encryption algorithm faster. The decryption algorithm and decompression method are big prove to success of proposed method that give target video without any noise, besides that has been verified from performance of proposed method using several quality measures performance of proposed methodتوفير الأمن لبيانات الوسائط المتعددة اصبح امراً ضروريا وخصوصاً بيانات أنظمة المراقبة التي تحتوي على فيديوات فهي أما معرضة للهجوم أو الأختراق عبر الانترنيت, ولحماية هذه البيانات أستخدمت طريقة مقترحة التي تجمع بين خوارزمية التشفير وخوارزمية التوقيع للحصول على فيديو مشفرو موقع, تم تطبيق خوارزمية التشفيرعلى الفيديو ليصبح غير واضح ولتأمين نقل الفيديو,وهذا تم بواسطة فصل الفيديو الىFrames وكلFrame تفصل الى Three Frames هي Red, Green, and Blue تشفرباستخدام ثلاثة مفاتيح عشوائية مختلفة التي ولدت بواسطة دالة لتوليد الارقام العشوائية . أما خوارزمية التوقيع طبقت لغرض التخويل التي تمكن المتلقي من التأكد من هوية المرسل وتوفير اتصال آمن بين طرفي التواصل . في الطريقة المقترحة طبقت طريقة ضغط قبل تطبيق خوارزمية التشفيرعلى الفيديو بواسطة استخدامDWT)) لتسهيل عمل خوارزمية التشفيرلأن الضغط يقلل حجم الفيديووهذا يجعل وقت التنفيذ لخوارزمية التشفيرأسرع ,خوارزمية فك التشفيروطريقة فك الضغط هم أكبر اثبات لنجاح الطريقة المقترحة التي تعطي الفيديوالمطلوب بدون اي تشويه, وبالاضافة الى ذلك تم التحقق من اداء الطريقة المقترحة بواسطة استخدام العديد من طرق قياس معايير الجودة. Video encryption --- Video compression --- Digital signature --- Mean Square Error(MSE) --- and Peak Signal to Noise Ratio (PSNR). In this paper, a new modification was proposed to enhance the security level in the Blowfish algorithm by increasing the difficulty of cracking the original message which will lead to be safe against unauthorized attack. This algorithm is a symmetric variable-length key, 64-bit block cipher and it is implemented using gray scale images of different sizes. Instead of using a single key in cipher operation, another key (KEY2) of one byte length was used in the proposed algorithm which has taken place in the Feistel function in the first round both in encryption and decryption processes. In addition, the proposed modified Blowfish algorithm uses five Sboxes instead of four; the additional key (KEY2) is selected randomly from additional Sbox5, the fifth Sbox is formed in GF(28) and it is variable to increase the complexity of the proposed algorithm. The obtained results were tested using many criteria: correlation criteria, number of pixels change rate (NPCR) and mean square error (MSE). These tested factors were approved by the output results which demonstrated that the correlation of image elements in the proposed algorithm was significantly reduced during the encryption operation. Also, the algorithm is very resistant to attempts of breaking the cryptographic key since two keys were used in the encryption/ decryption operations which lead to increase the complexity factor in the proposed algorithm.في هذا البحث، اقترح تعديل جديد لتعزيز مستوى الأمان في خوارزمية السمكة المنتفخه.هذه الخوارزمية تعتبرمن ذوات المفاتيح المتناظرة والمتغيرة الاطوال,وذات 64 بت كتلية الشفرات. والهدف من هذا النهج الجديد والذي يتم تنفيذه باستخدام الصور الرمادية ذات أحجام مختلفة، هو لزيادة صعوبة تكسير الرسالة الأصلية التي من شأنها أن تؤدي إلى تكون آمنة ضد نوع الهجوم الغير مخول به. فبدلا من استخدام مفتاح واحد في عملية التشفير، تم استخدام مفتاح آخر (KEY2) يتكون طوله من بايت واحد في الخوارزمية المقترحة والتي تم التحديث فيها في دالة Feistel في الدورة الأولى في كل من عمليات التشفير وفك التشفير. وبالإضافة إلى ذلك، تستخدم خوارزمية السمكة المنتفخة المقترحة خمسة Sboxes بدلا من أربعة. يتم تحديد مفتاح إضافي (KEY2) بشكل عشوائي من Sbox5 الاضافية، ويتم تشكيل Sbox الخامس في GF (28) ويكون متغير وذلك لزيادة تعقيد الخوارزمية المقترحة. تم اختبار النتائج التي تم الحصول عليها باستخدام العديد من المعايير: معايير الارتباط، ونسبة عدد البكسل المتغيرة (NPCR) ومعدل مربع الخطأ . (MSE)وتم التأكد من خلال الاختبار لهذه العوامل من قبل نتائج الإخراج التي أثبتت أن الترابط بين عناصر الصورة في التقنية المقترحة انخفض بشكل ملحوظ خلال عملية التشفير. وأيضا، فإن هذا النظام مقاوم لمحاولات كسر مفتاح التشفير وذلك لاستخدام مفتاحين في عمليات التشفير / فك التشفير التي تؤدي إلى زيادة عامل تعقيد في الخوارزمية المقترحة. Blowfish --- MSE --- Encryption --- Decryption --- NPCR --- Correlation --- Gray scale images. The rising temperatures are the most significant aspect in the period of climate variability. In this study PRECIS model data and observed data are used for assessing the temperature change scenarios of Sindh province during the first half of the present century. Observed data from various meteorological stations of Sindh are the primary source for temperature change detection. The current scenario (1961–1990) and future one (2010-2050) are acted by the PRECIS Regional Climate Model at a spatial resolution of 25 * 25 km. Regional Climate Model (RCM) can yield reasonably suitable projections to be used in the climate - scenario. The main objective of the study is to prepare maps. The simulated temperature as obtained from climate model-PRECIS and their comparison with observed temperatures. The analysis is done on all the districts of Sindh in order to have a more precise picture of temperature change scenarios. According to the results the temperature is likely to increase by 1.5 - 2.1°C by 2050, compared to the baseline temperature of 1961-1990. The model assesses more accurate values in northern districts of Sindh as compared to the coastal belt of Sindh. All the district of the Sindh province exhibits an increasing trend in the mean temperature scenarios and each decade is seemed to be warmer than the previous one. An understanding of the change in temperatures is very vital for various sectors such as weather forecasting, water, agriculture and health etc. في عصر التقلبات المناخية أن ارتفاع درجات الحرارة هو الجانب الأكثر أهمية. في هذه الدراسة أستخدم موديل لأجمالي درجات الحرارة ودرجات الحرارة الملحوظة كسيناريوهات لتقييم التغيير في درجات الحرارة في السند في النصف الأول من القرن الحالي.اعتبرت البيانات المرصودة من مختلف محطات الأرصاد الجوية في السند هي المصدر الرئيسي للكشف عن التغييرات في درجات الحرارة. في السيناريو الحالي تم دراسة التغيير بدرجات الحرارة خلال الفترة (1990-1961) و في السيناريو المستقبلي تم دراسة الفترة (2010-2050) من خلال عمل نموذج مناخي للمنطقة بقدرة تحليل 25*25 كم. من خلال النموذج الأقليمي المناخي ممكن تفسير توقعات مناسبة ومعقولة للتنبؤ بدرجات الحرارة المستقبلية.أن الهدف الرئيسي من هذه الدراسة هو لأنشاء خرائط لدرجات الحرارة المستقبلية ومقارنتها مع درجات الحرارة الملحوظة. وتم التحليل من خلال دراسة جميع مناطق السند من أجل الحصول على صورة أكثر دقة من سيناريوهات التغيير في درجات الحرارة. بينت النتائج المتوقعة انه من المرجح ان تزيد درجات الحرارة 5و1 – 2و1 درجة مئوية بحلول عام 2050، مقارنة مع درجات الحرارة الأساسية 1961-1990. كذلك بين النموذج دقة أكبر للمناطق الشمالية من السند بالمقارنة مع الحزام الساحلي للسند. كل الأحياء من أقليم السند تبين أرتفاع في معدل درجات الحرارة وكل فترة زمنية تبدو أنها اكثر دفئا من سابقتها. أن فهم التغيير في درجات الحرارة أمر حيوي للغاية لمختلف القطاعات مثل التنبؤ بالطقس والمياه والزراعة والصحة وغيرها. Thyroid is a small butterfly shaped gland located in the front of the neck just below the Adams apple. Thyroid is one of the endocrine gland, which produces hormones that help the body to control metabolism. A different thyroid disorder includes Hyperthyroidism, Hypothyroidism, and thyroid nodules (benign/malignant). Ultrasound imaging is most commonly used to detect and classify abnormalities of the thyroid gland. Segmentation method is a tool that used widely in many applications including medical image processing. One of the common applications of segmentation is in medical image analysis for clinical diagnosis that has an important role in terms of quality and quantity. The main objective of this research is to use the Computer-Aided Diagnosis (CAD) algorithms to help the early detection of thyroid tumors. Thyroid ultrasound images may contain speckle noise which leads to obtain incorrect result. In order to obtain good accuracy; the noise must be removed from the input image. Those propose method is started with pre-processing of the thyroid ultrasound image to enhance its contrast and removing the undesired noise in order to make the image suitable for further processing. In our proposed work, we are using bilateral filter and unsharp filter to remove speckle noise to perform the pre-processing operations on the thyroid ultrasound images. The segmentation process is performed by using Fuzzy C-Means (FCM) algorithm to detect and segment thyroid ultrasound images for the thyroid region extracted image to 6 classes for two sample normal and abnormal images. The resulted segmented ultrasound images, and then used to extract the tumor region from thyroid's image. الغدة الدرقية هي غدة على شكل فراشة صغيرة تقع في الجزء الأمامي من الرقبة أقل بقليل من تفاحة ادام. الغدة الدرقية هي واحدة من الغدد الصماء، التي تنتج الهرمونات التي تساعد الجسم على السيطرة على عملية التمثيل الغذائي. يتضمن اضطرابات الغدة الدرقية المختلفة , نشاط الغدة الدرقية المفرطة، تضخم الغدة الدرقية، وعقيدات الغدة الدرقية (الحميدة / الخبيثة). يعتبر التصوير بالموجات فوق الصوتية ((Ultrasound الأكثر شيوعا لكشف وتصنيف شذوذ الغدة الدرقية. ان طريقة تقسيم الصور هو الأداة التي تستخدم على نطاق واسع في العديد من تطبيقات المعالجة الصورية بما في ذلك معالجة الصور الطبية وهي واحدة من التطبيقات المهمة والشائعة للتجزئة لغرض تحليل الصور الطبية وكذلك لتشخيص المرض سريريا والتي لها دور مهم من حيث النوعية والكمية. الهدف الرئيسي من هذا البحث هو استخدام خوارزميات التشخيص بواسطة الحاسوب (CAD) للمساعدة في الكشف المبكر عن أورام الغدة الدرقية. ان صور الغدة الدرقية الماخوذة بواسطة الموجات فوق الصوتية(US) تحتوي على ضوضاء بقعية تؤدي الى حصول نتائج غير مرغوب فيها .ولغرض الحصول على نتائج مرضية يجب ازالة الضوضاء من تلك الصور . الطريقة المقترحة تتمثل بالتهيئة الاولية ما قبل المعالجة لصورالموجات فوق الصوتية للغدة الدرقية لغرض زيادة الوضوحية وإزالة الضوضاء غير المرغوب فيها من أجل جعل الصورة مناسبة للمعالجة. وقد تم اعتماد المرشحات لهذا الغرض. ان عملية تجزئة الصورة تمت باستخدام خوارزمية معدل التضبيب المسماة بالـ ( Fuzzy C-Mean (FCM) لتجزئة الصورة الى ستة اجزاء. حيث تم استخدام نتائجها بعد ذلك لعزل منطقة الورم من صورة الغدة الدرقية . The drought is a globally phenomenon, its influence will convert large parts of Middle East and North Africa (MENA) region into hot dry deserts under the expectations of the climate change scenarios. Climate limitations, soil erosion affected by weather properties such as unequally and limited rainfall; temperature changing and wind, unsuitable irrigation techniques, excessive grazing, agricultural expansion against to the natural habitats, extensively clearance of natural vegetation, and soil salinity had all contributed to land degradation, reduced water supplies, and limited agricultural production in Iraq. It is estimated that nearly 54.3 % of Iraq's area is threatened by desertification problems. 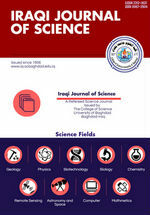 In this research, for Iraq the Climatic Quality Index (CQI) has been utilized to state the arid and semi-arid lands area variation during the interval (1980-2012) using the meteorological data of eleven stations. The results shows that at the end of eighties decade the arid lands covered only 73% of Iraq's area, and the arid lands covered 78% of Iraq's area in the nineties decade, while in the first decade of the second millennium the arid lands rapidly increased to cover 88% of Iraq's area. this search shows that the "Global Warming" was the reason beyond the temperature averages increments within last climate period which lead to arid regions rapidly extension in Iraq. الجفاف عبارة عن ظاهرة عالمية, تاثيراته ستحول اجزاء كبيرة من منطقة الشرق الأوسط وشمال أفريقيا ال ( MENA )الى صحاري حارة جافة وحسب توقعات سيناريوهات التغير المناخي. الاحوال المناخية القاسية, تعرية التربة بسبب بعض الخصائص الجوية كالامطارالمحدودة و غير المتساوية الانتشار; الحرارة والرياح, تقنيات الري غير الملائمة, الرعي الجائر, التمدد الزراعي على حساب المواطن الطبيعية, الاقصاءالشامل للنبات الطبيعي, وتملح التربة كلها ظروف اسهمت باضعاف التربة, تقليل الموارد المائية, وتحديد الانتاج الزراعي في العراق. من المتوقع ان 54,3% من مساحة العراق مهددة باشكاليات التصحر. في هذا البحث, تم استخدام معامل نوعية المناخ CQI)) لتحديد التغاير في مساحة الاراضي الجافة وشبه الجافة داخل العراق وللفترة (1980-2012) بواسطة استعمال البيانات الانوائية لاحدى عشرة محطة. النتائج بينت بان الاراضي الجافة غطت 73% من مساحة العراق عند انتهاء عقد الثمانينات, والاراضي الجافة غطت 78% من مساحة العراق عند نهاية التسعينات, في حين تزايدت رقعة الاراضي الجافة بسرعة لتشمل 88% من مساحة العراق في نهاية العقد الاول من الاالفية الثانية. هذا البحث بين بان "الاحتباس الحراري " كان السبب وراء تزايد معدلات درجات الحرارة خلال الدورة المناخية الاخيرة والتي افضت الى التمدد السريع للمناطق الجافة في العراق. aridity index --- GIS --- Global warming --- Thornthwaite --- and meteorological data .